The duo who won the Newbery Award (and Caldecott honor and Coretta Scott King Illustrator award) for the picture book Last Stop on Market Street in 2016 have created another marvelous picture book that depicts the life experience of children of color and socioeconomic class not often represented in kid's books while also sharing a story of siblings that is universal with Carmela Full of Wishes. It's Carmela's seventh birthday she is most excited because she is finally old enough to go with her big brother to the Laundromat. 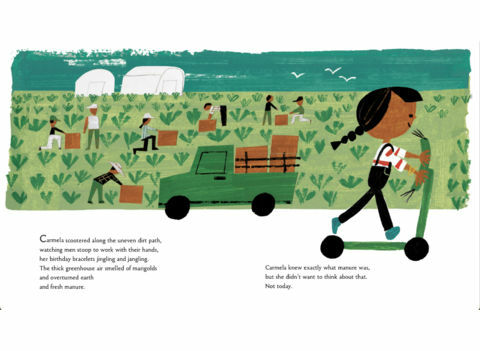 Hopping on her scooter and jingling her birthday bracelets, Carmela takes in the sights, from watching the men in the fields working with their hands, to the old people's home to a stop at her brother's friend's house. As she scoots, she imagines a machine in her room that would spit out anything she could think of (but mostly candies). 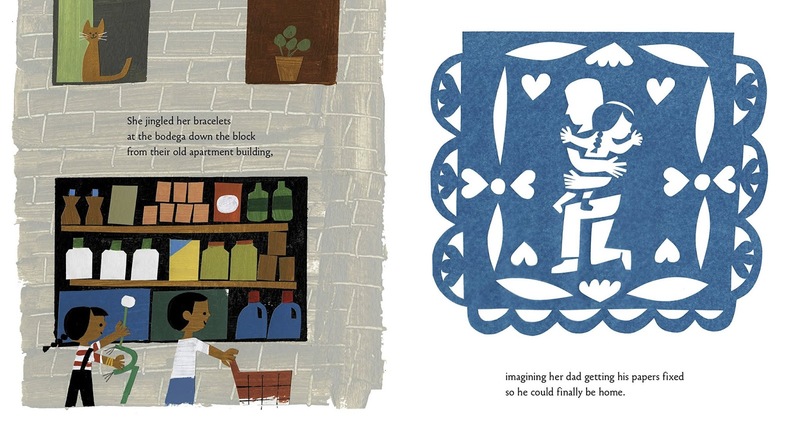 She imagines her mother getting to sleep in a bed as fancy as the ones she makes every day at the hotel where she works and she imagines, "her dad getting his papers fixed so he could finally be home." And, as she scoots and jingles her birthday bracelets, she also annoys her big brother, who is frustrated that she doesn't even know how to make a wish on the dandelion she's picked! 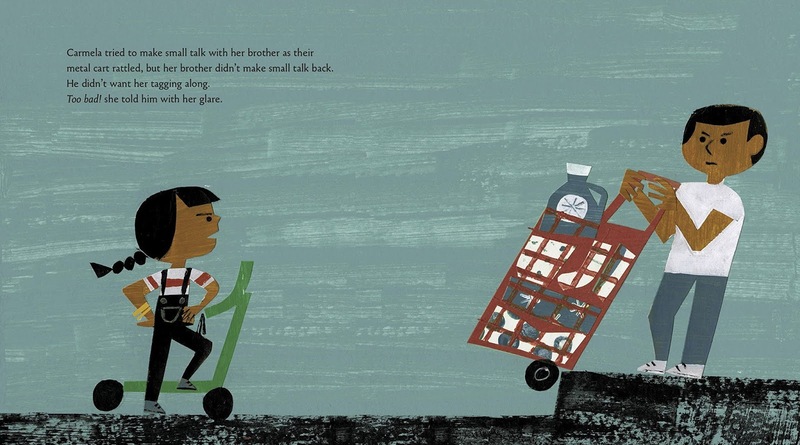 When Carmela crashes her scooter on the way home, she is most upset about her crushed dandelion and her lost wish. Annoyance turns to empathy and Carmela's big brother picks up her scooter and takes her hand, leading her to a special place, telling her to close her eyes and make a wish. 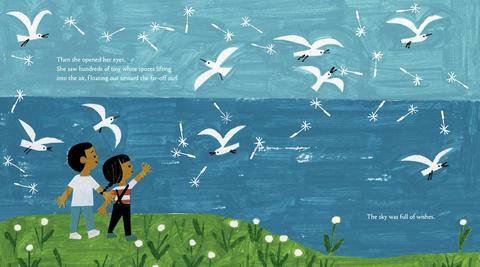 When she opens them, she sees that, "The sky was full of wishes." Both de la Peña and Robinson are native Southern Californians and the illustrations have a very authentic feel, from the endpapers that show farm laborers in rows of crops to the coastal farm that reminds me of a strawberry farm nearby, although, the cliff that Carmela and her brother visit at the end of the book would be a piece of real estate property in development if it were truly in So Cal... Robinson's use of papel picado to also tell the this story fits in perfectly with his collage-style paintings. 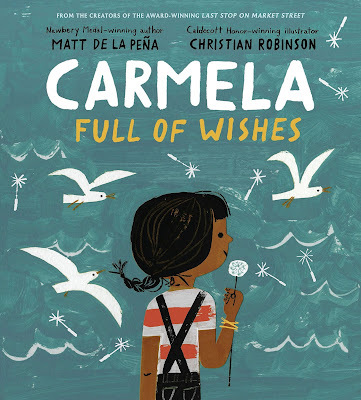 But, Carmela Full of Wishes is not about being Latinx or the child of immigrants or living in poverty. It is about Carmela. And, to that end, in a twist that I absolutely love, Carmela's big brother is always and only referred to as that. Being a big sister to a brother, and having my firstborn be the big sister to two brothers, I am deeply sensitive to the many picture books (hopefully, mostly of the past) where the sister is known only as such. 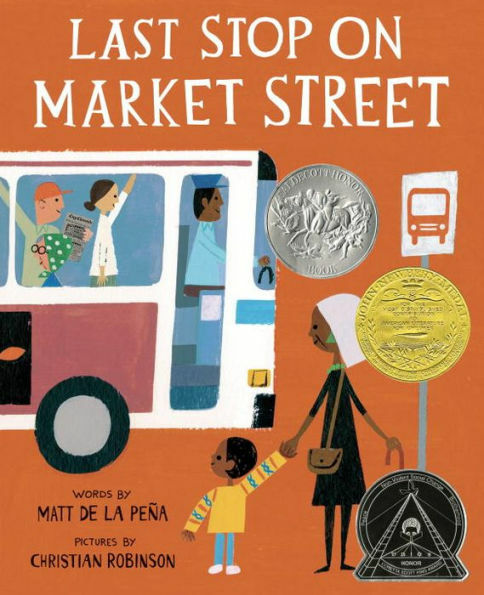 It was amazing - and required several re-readings on my part to confirm - to read a book where the brother went unnamed while the sister is the titular character!